I have used an eye cream in the morning and evening for years now but I had never heard of an eye serum prior to a sample of this product popping out of the No7 advent calendar last year. I suffer from dryness around my eye area and dark circles under my eyes and while eye cream does help this I was hoping that the No7 Youthful Eye Serum would be the extra help my eye area needed. This serum is packed full of anti-aging ingredients; such as Hyaluronic Acid, Vitamin C and Vitamin A, that work together to smooth and brighten the eye area whilst also firming the skin, reducing puffiness and the appearance of dark circles – it sounds like a wonder product doesn’t it. For the best results, the instructions advise to apply the serum morning and night either alone or under an eye cream. I have found that I prefer to use the Youthful Eye Serum under an eye cream to ensure that my eye area has an extra shot of moisture, but it also works well on its own. The serum has a very light weight texture to it, so even with applying two products to my under eye area it does not feel heavy or weighed down like I have applied too much product. I have used this under a few different eye creams now and find that it works well under all of them. Now, does it do what it says on the tin – or tube, rather. I can wholeheartedly say that yes it does do what it claims too. I have been using this product since the beginning of January and my eye area feels and looks more hydrated, it is less puffy and more importantly my dark circles have reduced so dramatically I now only need a light concealer as opposed to a heavy high coverage one. Not only that, I have found that makeup applies much more evenly and smoothly to my under eye area and I have less trouble with it creasing too. I love this product so much that before my sample ran out (sometime in mid March) I made sure I had a back up so I was never left without it. I believe the sample I had was around 5ml which lasted me nearly 3 months of using it day and night. The full size is 15ml so it should last me at least around 9 months which I feel is great value for money. I would highly recommend giving this a try if eye cream alone just isn’t cutting it for you. It may feel like an unnecessary step, but let me tell you, once you give it a try you will wonder how you ever did without it. 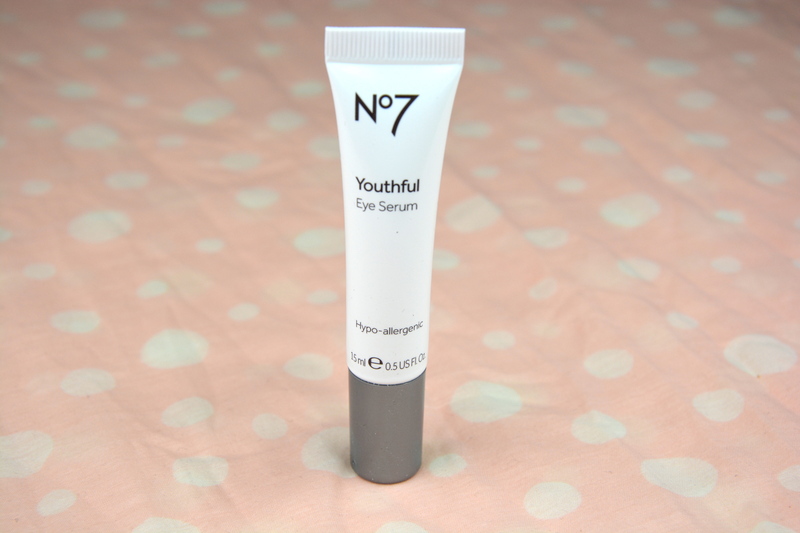 The Boots No7 Youthful Eye Serum retails for £19.50 and is available here.